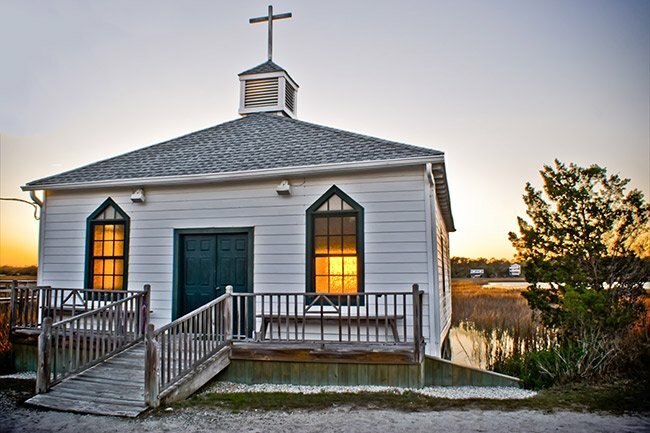 Originally home to the Pentecostal Holiness Church in nearby Georgetown, this quaint chapel did not arrive on Pawleys Island until the late 1940s, when it was dismantled and transported to the island. The chapel was carefully rebuilt by the Georgetown Laymen’s Association in 1946 and dedicated on June 6, 1948. It rests on land donated by Dr. and Mrs. J. H. Porter. 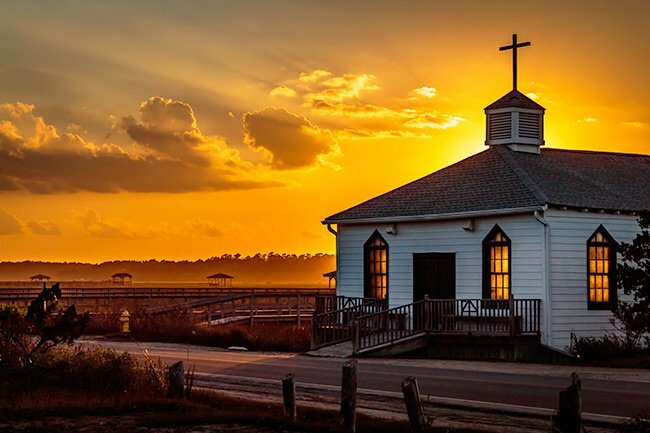 The formal name of the church is the Pawleys Island House of Worship, though it is more commonly known simply as the Chapel. 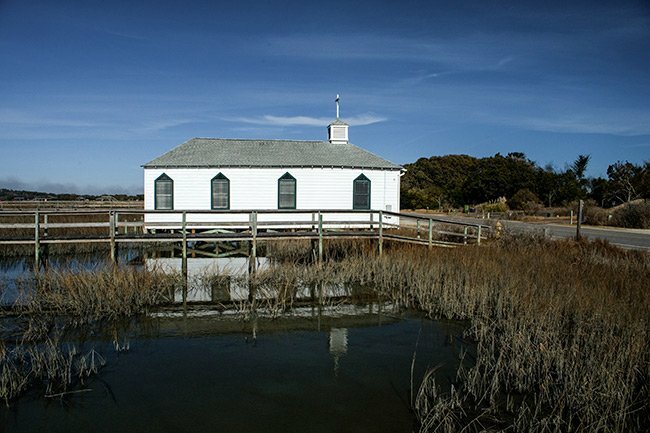 The small church managed to survive both Hurricane Hazel and Hurricane Hugo, and it continues to serve as the island’s only house of worship. Services are held each Sunday at 10 AM. 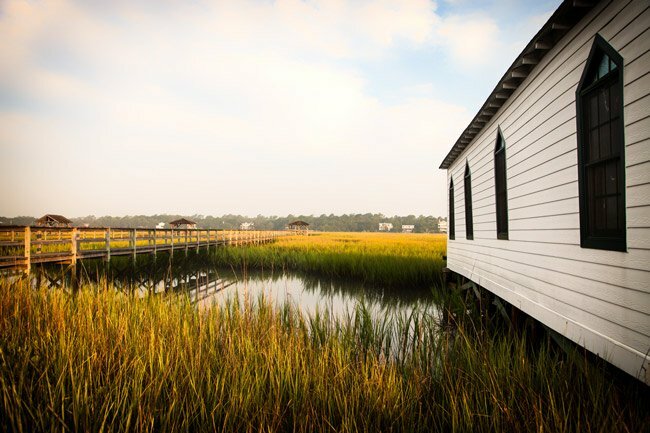 The small sanctuary extends into the marsh, affording visitors a singular view of the tidal creek. 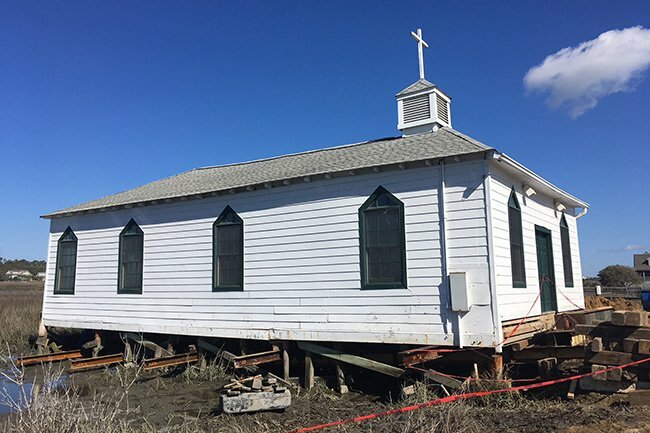 Though vulnerable to floods due to heavy rains and high tides, the chapel has so far remained unscathed by rising waters. 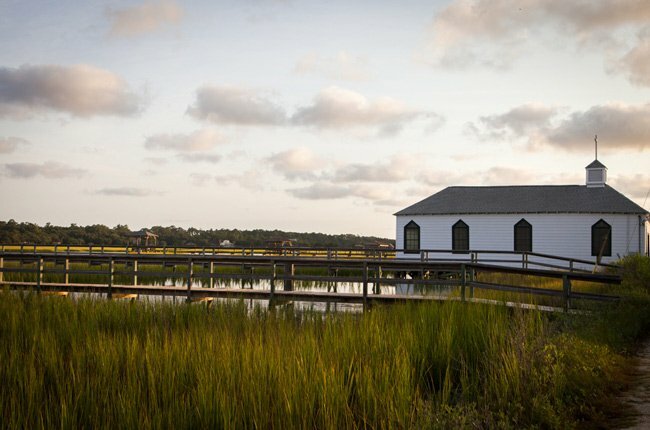 The Pawleys Island Chapel is available for weddings from September through May, and ceremonies must be conducted by an ordained minister. See contact information below. 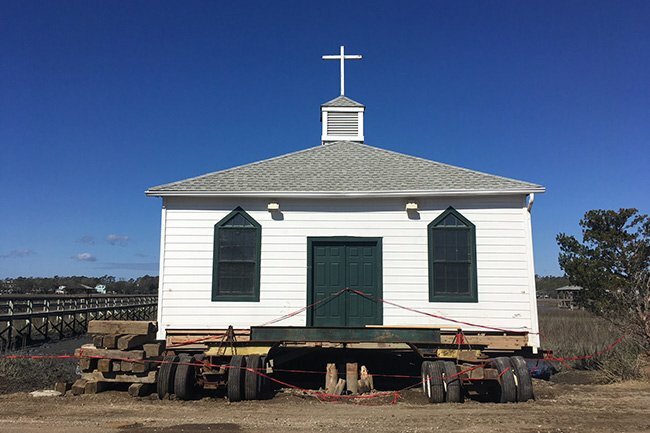 In late 2017, the owners of the chapel, The Pawleys Island House of Worship, obtained permits for the chapel to be lifted from its foundations and moved across the street so repairs could be made. Because the chapel serves as a place of worship, work was held off for several months until services finished for the season. The chapel was also booked for several weddings throughout December. 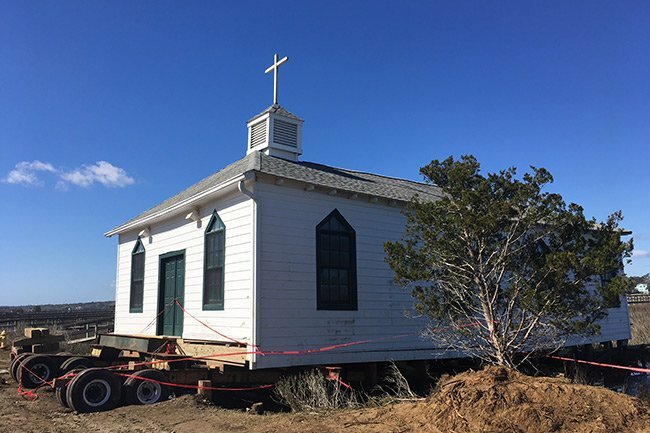 On Monday, February 19, 2018, the chapel was loaded up and moved across the street to rest at its temporary home between the North and South Causeways. Construction crews will reinforce the chapel’s foundation and then put the chapel back. Work is expected to take several months. Do you know which of these photos you are interested in? We would be able to reach out to the photographer for you or if you’re interested in one of Treva’s for example, click her name and her website will direct you on how to contact her directly if you’d like. Thanks for the interest and congratulations to your son! Where can I purchase framed photos of the church? My son and his fiancé will be married there on March 30, 2018. 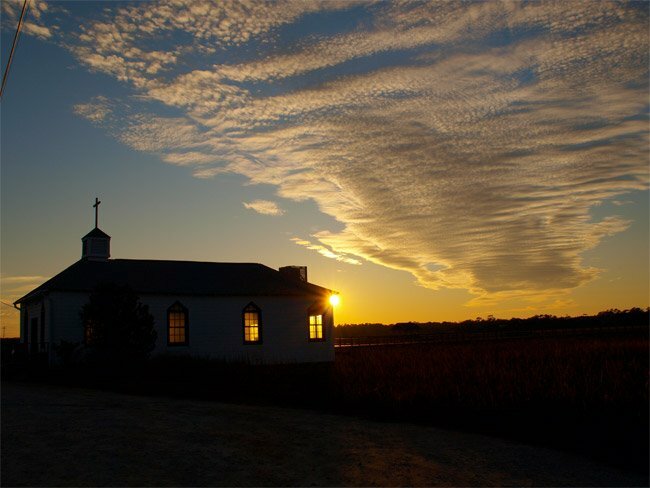 This is a beautiful little church and the home of my wedding ceremony. I highly recommend this place. The chapel is still standing! Take the North causeway and then the right fork and it is down just a little on the right. For more specifics, use the map and coordinates on this page to find it and call Pawleys Island Realty for rental information (the website listed on this page above the map). Hi, we can’t find the chapel. Was it destroyed by Hurricane Matthew? We want to book a May 13th, 2017 wedding. Hi, Bonnie. What a generous offer! Please contact someone from the following website about what you can do to help: http://www.pawleysislandrealty.com/pawleys-island-house-of-worship Thank you! Wonderful, thoughtfully framed photographs by all 3 photographers. Well done.